Mahindra today has launched its second fully-electric passenger car - e-Verito with prices starting at ₹ 9.50 lakh (ex-showroom, Delhi) for the D2 variant, going up to ₹ 10 lakh for the range-topping D6 trim. An all-electric version of the car maker's Verito sedan, the e-Verito was first showcased at the 2012 Auto Expo and went on to make appearances at the 2014 and 2016 editions of the motor show. The electric sedan will be available across most major cities including Delhi, Mumbai, Bangalore, Kolkata, Chandigarh, Hyderabad, Jaipur and Nagpur with immediate effect. The Mahindra e-Verito is powered by an electric motor coupled with a 72V battery pack. The Indian auto giant claims the electric sedan offers a driving range of 110 km on a full charge. The EV uses a lithium-ion battery that takes 1 hour and 45 minutes to be fully charged through fast charging technology and will take over 8 hours on regular mode. The e-Verito's top-speed is rated at 86 km/h. Mahindra says that the running cost on the EV comes down to ₹ 1.15 per km. In terms of design, the electric Mahindra e-Verito sedan retains its diesel sibling's silhouette. However, it does get a handful of stickers and a revised interior to help differentiate it from the standard Verito model. Mahindra is offering the e-Verito in three trim options, namely, D2, D4, and D6. As mentioned above, the eVerito is the second all-electric Mahindra car after the e2o. And considering the debate and the chaos against rising pollution in the country and the role of diesel cars in those statistics, the launch comes at the right time. 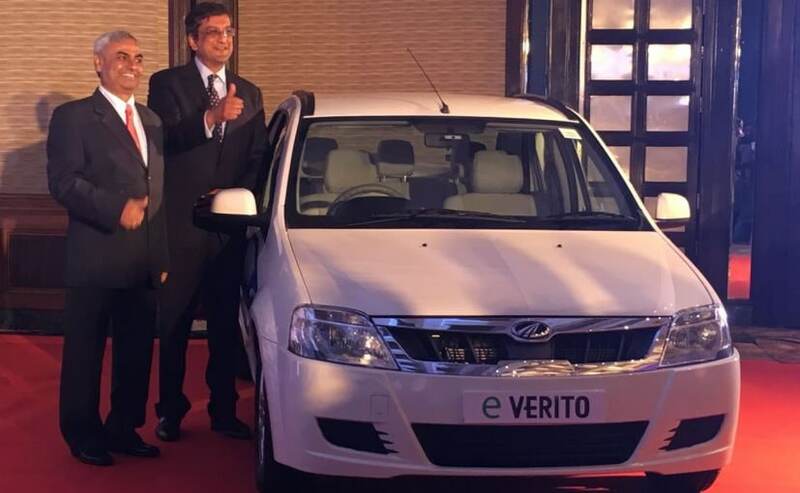 The e-Verito also benefits from the Indian government's Faster Adoption and Manufacturing of Hybrid and Electric vehicles in India (FAME) initiative, which has helped gain subsidies on the asking price. In terms of features, the emissions free Mahindra eVerito gets a host of tech wizardry on board including regenerative braking, on-board telematics, REVIVE, and Intelligent Energy Management System. You also get the Boost mode on the eVerito that gives you extra power.